General classes are held on Tuesday evenings from 8.00 p.m. to 10.00 p.m. at Great Mongeham Village Hall. The cost is £1 per night. Membership fee is £5.00 per annum and there is a charge of £1.00 per class / evening. 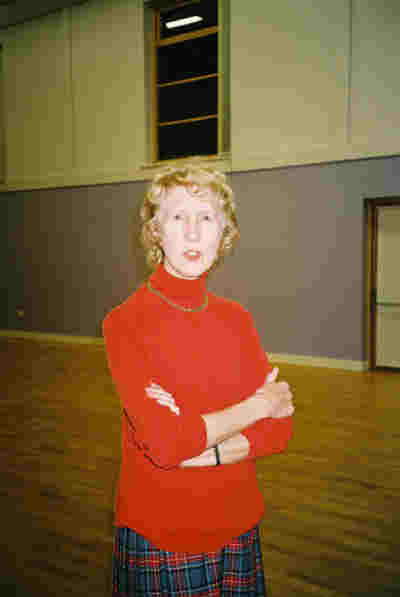 The club holds dances in the Spring and Autumn and the details of the next dance are given above. 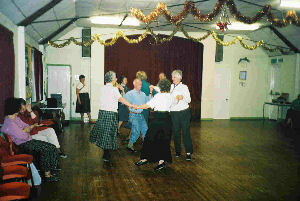 In addition the members of the society can participate in the many dances and events run by the other members of KASS. This provides a very full and active programme. Shortly after my late husband was appointed to the Royal Marines Barracks in Deal in 1948, I met, at a party in the Officers' Mess, Brigadier H.M.McIntyre. We discussed Scotland (he originated from St Andrews and I from Inverness) and Scottish Dancing etc and decided that a Scottish Country Dance group might be a welcome asset to Deal. After several discussions, we were given permission, by the then Commanding Officer, to meet weekly in a room in the Barracks, and that the classes would be for Royal Marines personnel and their families. In the 50's and 60's the Royal Marines School of Music in Deal accepted a number of overseas music students for training. Of these students, 3 joined our S.C.D. Group and very quickly mastered the dances and accompanied us to various dances. Our dancing students were Dan from Ceylon, Tesfaye from Ethiopia and Sam from Thailand. In 1965 our Group decided to devise a dance in honour of Brigadier McIntyre. We called the dance "The Brigadier McIntyre Reel" and Dan (Lieutenant D. Danwatto L.R.A.M., A.R.C.M. of the Royal Ceylon Navy composed the music. This dance was first demonstrated at a dance in the Royal Marines barracks, Deal on 16th October 1965 and the M.C. was the late Jock Young, the leader of the Folkestone Group which used to meet in Newington Village Hall - now, like much of East Kent demolished for the Channel Tunnel. Jock Young was quite a character. His dances were all started with a piper and "The Grand March". Jock disliked (and let everyone know he did) English men who wore kilts, and one in particular (now dead) English man who wore a Glengarry!! In the days before motorways, several of our members travelled to Tunbridge Wells, Maidstone, Chatham etc. to attend dances, and picnicked by the wayside on our way home. When "outsiders" wanted to join and when our numbers increased and security in the Barracks tightened we looked for other venues in Deal. We met in various halls over the years, until when our membership increased to approx. 40 members we decided to meet in Great Mongeham Village Hall where we still meet every Tuesday evening. Brigadier McIntyre danced until he was almost 90 and died at 101 and a half years - I gave up dancing at the age of 81 years after a couple of orthopaedic operations but am still the Hon. Secretary of the Group. To find out more about the Deal Scottish Country Dance Group and their activities click on the image below and send an email or use the link on the KASS Contacts page.